The purpose of a boat trailer jack is to raise and lower the trailer so that you can hitch it to your vehicle. It will also keep the trailer level when not attached to the vehicle and stabilizes the trailer for loading and unloading when the trailer is parked. The best boat trailer jack is the Fulton 1413040134 F2 Wide Track, that comes with a choice of wide or twin wheels and a limited lifetime warranty against defects. Trailer tongue jacks come in a range of sizes and weight capacities and its important to measure the distance from the floor to your vehicles hitch. The extended trailer tongue jack must be able to lift above the hitch in order to connect to it. Understanding the trailer tongue weight is important figure that you must consider beforehand. It is often around 10 to 15% of the gross weight of the trailer and boat combined. It is advised to exceed the weight capacity to avoid any complications. If you are new to using boat trailer jacks, then they will completely transform the way you load your trailer to your vehicle. Installation is fairly straight forward and if maintained correctly, they will be long lasting too. There is a variety of sizes, wheels and other features available dependent upon your budget. Below is a list of the best boat trailer jacks that will make moving the trailer around in the boat yard and hitching to vehicles far easier. The Fulton F2 trailer tongue jack is available with a single wide track wheel or twin wheels that are both capable of handling 1,600 LBS of weight. The design of the F2 model by Fulton is maintenance free without the need of lubrication. The construction is completely corrosion free with resistant coating over the internal and external components, which is great for trailers used in saltwater. In terms of the using the trailer jack, the ergonomic design made from durable plastic is comfortable to touch and cranks smoothly. As the jack is made from aluminum and other hardware from plastic, it is completely safe to use in saltwater with no worries of corrosion. 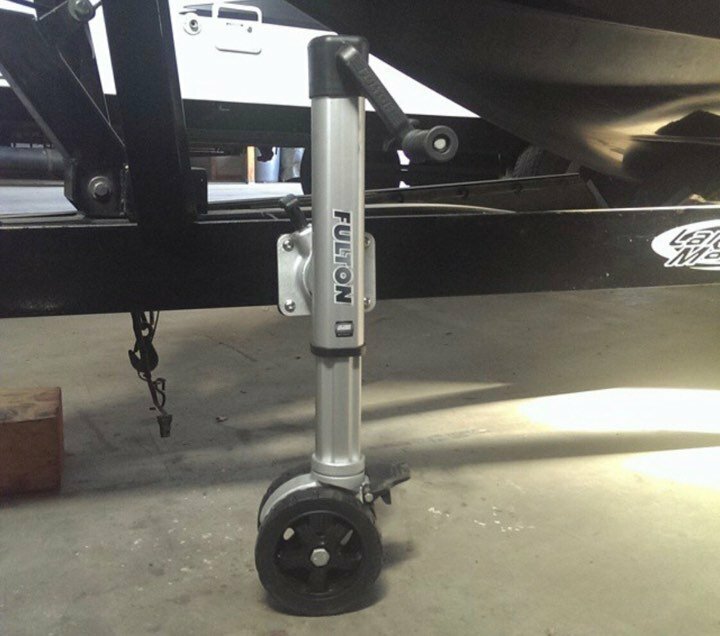 Overall, the Fulton F2 Wide Track is the best boat trailer jack that comes as a single or twin wheel setup. It is more expensive than the alternatives but the smoothness of the cranking and the sturdy aluminum construction is worth the extra. For those looking for something special, the Trailer Valet X5 V211 is an excellent option. 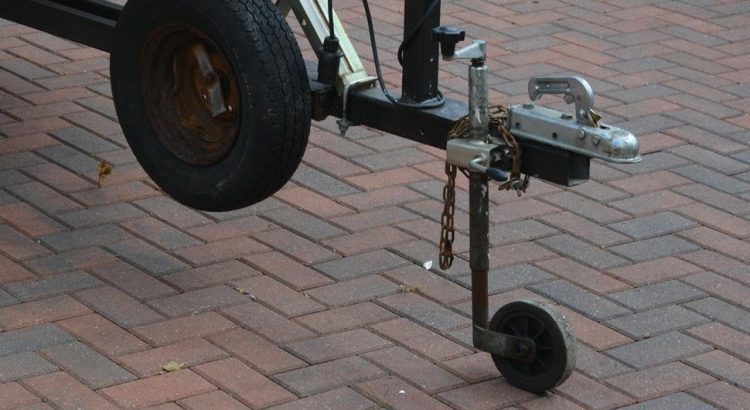 It doubles up as a motorized trailer dolly and tongue jack, which will easily move and lift your boat trailer up to 5,000 LBS. Due to the fact it is both a trailer dolly and tongue jack, it does come with a premium price tag. However, it does come with a one year manufacturers warranty and the brand states that it will withstand 300 hours of corrosion resistance. The MaxxHaul is a dual wheel tongue jack that has a weight capacity of 1,500 LBS and lifts back up to the trailer when not in use. All the hardware and bolts come as a package with this unit, which makes the installation straightforward. Overall, the MaxxHaul 70149 is the best boat trailer jack for the money and includes the desirable functionality of folding up when not in use. Unlike other boat trailer jacks, this can be mounted in any position and bolts onto a 3 x 5 inch rectangular or square shape beam. The Dutton-Lainson is a heavy duty trailer tongue jack with a 1,200 LBS weight capacity. It uses an enclosed tube design to protect the moving parts and is finished in a zinc coating for protection against corrosion. Overall, the Dutton-Lainson is a heavy duty trailer tongue jack that is easy to install and a great addition to any boat trailer. Unlike many of the cheaper alternatives, this trailer tongue jack is made in the USA and meets the high standards. Reese Towpower are known for a range of trailer products in both the marine and automotive industry and this 74410 trailer jack is a great example. It is designed to be heavy duty and withstand a lot of punishment in the challenging conditions. The Reese Towpower 74410 is by far the most popular and features a swivel mechanism that can take a lot of punishment. Overall, it is a direct replacement that is cheap and built by a reputable brand known for high quality trailer products. The Pro Series is a boat trailer tongue jack that is targeted towards those looking for a direct OEM replacement. It has a weight capacity of 1,000 LBS and includes all the mounting hardware for a hassle-free installation. The Pro Series is one of the cheapest trailer tongue jack yet has been built to the quality expected of the premium models. It is a great all-rounder that is ideal for switching with your OEM tongue jack and includes all the hardware for an easy installation. The standard tongue jack that comes with the trailer is often poor quality and a pain to use. Many can be fairly old too, which means they can be corroded and are simply not up to the job anymore. Upgrading to the recommended trailer jacks above will see movement of your trailer around the boat yard become much easier as well as hitching it onto your vehicle. Trailer jacks are not as straight forward as they seem and there are many variations in terms of tongue weights, extended heights and construction. Below are some factors you should consider before replacing your current jack. The downward pressure the coupler puts onto the hitch ball is known as the trailer tongue weight. This weight is usually 10 to 15 percent of the gross trailer weight (with the boat attached). You will want to ensure you get a trailer tongue jack that supports a weight larger than your gross trailer weight. For example, if the trailer has gross weight of 4,000 LBS, it will need to have a tongue weight of at least 400 to 600 LBS. The tongue of the trailer will need to reach the trailer hitch of your vehicle. Therefore its important that you measure the height from the floor to the trailer hitch before purchasing a boat trailer jack. Failing to make the correct calculation may leave you in a bit of trouble when trying to lift the trailer to your hitch. However, it should also be short enough when retracted so that it has enough ground clearance when moving the trailer around the boat yard. As the boat trailer jack will be subjected to saltwater and general marine conditions, its vital that is suitably protected. Unlike the trailer that will most likely be galvanized, most trailer jacks are not and it is up to the manufacturer to provide protection. Most will use a zinc coating but as good practice, you should always clean the jack after being used in saltwater. Upgrading your old and corroded boat trailer jack is a worthwhile investment. The latest available are designed to be installed with ease and provide fast cranking. There is a wide variety of boat trailer jacks available and we strongly recommend avoid the cheap alternative available.